Glass mosaic tiles can make for an eye-catching feature in both kitchens and bathrooms. With textured glass effects available in a variety of colours you can enhance any neutral space with a mosaic feature wall or border. 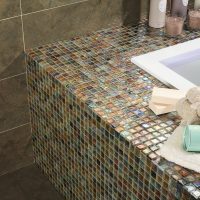 With mosaic tiles boasting stunning iridescent sheens you can create a luxury effect in your kitchen and bathroom or for an exotic look try rich embossed mosaic tiles available in different colours, they can help to create a distinct look for your home. We also have a range of glass mirror mosaics, a great addition to any home, for that modern sleek finish. Have you thought about adding some mosaic tiling to your house? 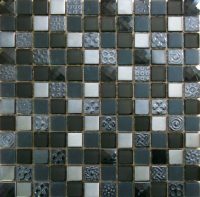 Glass mosaic tiles are eye-catching in either your kitchen or bathroom. A simple way to update the look and feel of your house is to redecorate. Adding tiles is a great option as it adds both colour and a feature to a room. 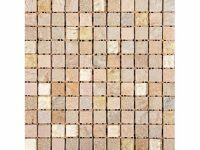 Mosaic tiles are popular as they are quite easy to install and you are able to create any design you want. 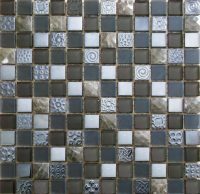 What Are The Benefits of Glass Mosaics? Glass tiles are becoming more and more popular as people realise they can have tiles made of a truly beautiful material. Glass tiles seem to add a sophisticated look when used well. But why should you try glass mosaic tiles? Light. Glass tiles reflect light more than any other type of tile, so they can change the perceived dimensions of a room. A small room will appear light and airy with the clever use of glass mosaic tiles and careful lighting. Depending on their colour and position, they can let in natural light or add a lovely coloured hue to a room. Silver can add a mirror effect to really brighten an otherwise dull area of the room. We also stock an extensive range of metal and metallic mosaic tile options, so browse our collection here. Water. Glass tiles do not absorb any moisture so they a great choice for bathrooms or kitchens. Clean easily. 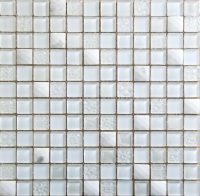 Glass mosaic tiles are easy to keep clean as they can just be cleaned with a wet cloth. Stain resistant. Because the material is non-porous, glass mosaic tiles don’t stain. Style and size. 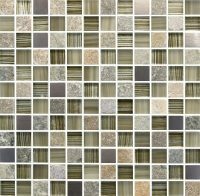 Glass mosaic tiles are available in various styles and sizes and almost any colour you can think of. This means you can easily achieve a unique look. As you can see, once installed mosaic tiles are fairly easy to look after, which is one of the reasons they are popular. Kitchens are messy places and you want the walls above your counters to be easy to clean and able to cope with splashes. This is why having a splashback made from glass mosaic tiles is becoming more popular. 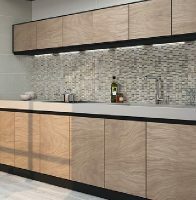 The tiles are easy to clean and you can achieve decorative and modern finishes to your kitchen. Glass tiles are definitely trendy in the kitchen. If you already have some tiled areas in your kitchen but you don’t want the expense of replacing them, don’t worry. You can achieve some great looks by mixing glass mosaic tiles with tiles of different size and texture. Place them around a backsplash to really draw light and colour to that area – a dazzling blue can go a long way to transform a dull sink area. Areas of glass tiling look really nice against metal. This is why they work so well in a kitchen, as they mix well with metal appliances. Don’t be afraid to be really bold with your kitchen tile choices as a daring look can be quite stunning. Our twilight red tiles will look great with some silver appliances. If you would rather try some glass mosaic tiling on a smaller scale, then the bathroom is a perfect option. You can be traditional with some blue and white colours and tiles like the Blues Mosaic work really well with their wavy look and feel. 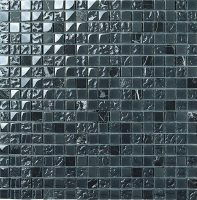 We have glass mosaic tiles with an iridescent sheen which allows you to create a luxury look and feel in your bathroom. Combine this with some clever lighting effects, and you add a truly luxurious feel to your room. If you don’t want to replace your existing bathroom furniture, you should easily be able to find a tile colour that will match and complement your current look. Many people use glass mosaic tiles for the walls, but don’t think about using it for the floor as well. Think how well these tiles work in an expensive spa. Then think about achieving that look in your own bathroom or wet room. They will instantly give your room a look of elegance and sophistication whilst being easy to maintain. You will find there are advantages to using glass mosaic tiling on the floor, as there are on the walls. Easy to clean. As with the walls, the tiles are easy to keep clean as they can just be wiped with a damp cloth or mopped. Stain resistant. The glass tiles won’t stain and are resistant to mildew. Light. These tiles reflect light, even when on the floor, so you will achieve a lighter look in the room. Rooms that get a lot of natural light look spectacular with the right tile on the floor. Durable. Glass mosaic tiles are durable even on the floor, but they can be scratched. Clearly, they will break if dropping something heavy from a height onto them. Customisation. This is without a doubt the biggest benefit when you use glass mosaic tiling on the floor. You can achieve a look that is unique to yourselves and it can be as simple or as complex as you want. You can choose one colour or multi-coloured tiling and you can make fairly intricate patterns with different sizes and colours. One thing to be aware of when using glass tiles on the floor is that they can be slippery. This is especially true in a wet environment like a bathroom. You can use tiles with a textured finish rather than a smooth finish. Where Else Can I Use Glass Mosaic Tiles? You might be wondering if you can only use glass mosaic tiles in the kitchen or bathroom, but that is really not the case. Glass tiles can be used in other rooms in your house to great effect. Utility room. Although these rooms are normally not remarkable for their attractive looks, glass mosaic tiles work well in a utility or laundry room. This is not due to their appearance but their functionality. 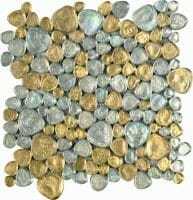 The fact that they can withstand a moist, humid environment, and they are quite durable makes them ideal for handmade decorative features or a sink backsplash. They will also brighten a room that may only have small windows or not get too much natural light. You can even use them to create a countertop. Borders. You can make a lovely border on a wall using our glass mosaic tiles. Due to the number of colours available, the border can match the wall colour or create a contrast. Using a sparkly or textured tile provides interest to a large wall space. If you don’t want to tile the whole of the bathroom, set a border of glass tiles just above the top of the bath. Wall designs. With their ability to reflect light back into a room, and the exotic looks you can achieve by using different textures, glass mosaic tiles can look great on a wall. You could form a mural, or add them round a picture, window, or mirror. You could even add one wall in shimmering or mirror tiles to add a wow factor at the top of the stairs, for example. Inset. You can add some glass mosaic tiles as insets into a wall or even a countertop. You can even use them to form a complete counter in your bathroom. Entrance hall. Glass mosaic tiles brighten up an entrance hall, especially if there is not much natural light. Choose a light, neutral colour and you will be surprised at how bright it looks. Conservatory. Some of our glass mosaic tiles are suitable for use in the conservatory which can achieve a stunning look. In addition to using glass mosaic tiles on walls and floors for a traditional look, these other looks are options you may want to consider. Glass tiles are becoming very popular thanks to their beauty and light reflecting properties. They can be used to create a very attractive look and we hope that you have been motivated by our guide to using glass mosaic tiles to get a fresh look. 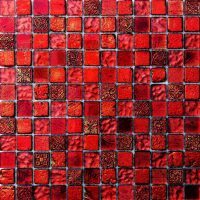 Browse some of the glass mosaic tiles on our site, for inspiration. We have a range of tiles in different styles and a vast array of colours in our shop. Call us today for details on prices, samples, information on how to buy and delivery. Prices are available on each product page. If various sizes are available to order, check the drop down to reveal the prices or deals available for that particular size in the collection. We also stock a huge variety of other handmade options, including stone, ceramic and porcelain. Please ask for any advice you might need, or check out our installation gallery for inspiration and ideas.